Mason was the 2015 National Western Stock Show Grand Champion Polled Bull and Supreme Champion Hereford and the 2015 Hereford Champion of the World. 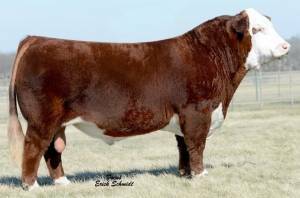 In 2014, he won North American International Livestock Exposition Grand Champion Hereford Bull and the American Royal Reserve Grand Champion Bull. In 2013, Mason was the 2013 Junior National Reserve Grand Champion Bull. This bull is super fronted, balanced and attractive. He is a true performance bull with thickness, muscle shape and width. Mason is big footed, massive boned, big ribbed and extra stout and should sire powerful calves with style, growth and performance.